Newborn babies do not have head control, the ability to lift and move her head on her own. It is a motor skill that develops with plenty of tummy time. With the early gross motor skill of lifting the head, baby develops strong neck muscles. The action of lifting the head strengthens baby’s neck muscles so she can eventually hold her head up on her own. Until she can hold her head up all by herself, her neck muscles are weak and she needs support. When you hold her or move her from one place to another, please use your hands and forearms to provide extra stability for her. Young babies need support to prevent their heads from falling to the side and over stretching ligaments or muscles. For a more detailed explanation about why babies need neck support please read our post on baby head support. WHEN CAN BABY HOLD HEAD UP? Often babies learn to hold their heads up for long periods of time on their own by about 5 or 6 months of age. At this time you can hold them upright and baby can manage her own neck control. However, even at this stage it is a good idea to put a hand behind baby’s head and neck to support her as she goes down toward the floor. Often the action of putting baby down on the floor moves her through a backward motion which can be stressful on the neck. We recommend putting your hand on the back of baby’s head and allowing your wrist and forearm to cross in back of her neck and upper back. This puts her head, neck, and torso in one piece as you move it so no part can unsafely dangle. When she is on the floor, roll her a bit to one side and place your hand behind her head and then roll her back onto your arm before picking her up. Observe baby Zizu (5 months) in the above photo receiving some extra support as she is picked up from the floor. Always support baby’s head when holding and moving her. Avoid playing the game of tipping her head backward (even if she seems to like it). It over stretches ligaments. Learn to roll her to the side to place your hands in the best place for her to feel your support. This includes behind her neck. When baby is able to hold her head up on her own in a few months, continue supporting her head as you put her down for naps or floor time. One of the most commonly-needed supports for baby is that of the head and neck. This is often easy to do when holding the baby in one’s arms but challenging to do when picking baby up or putting her down. It is the transition from picking her up off of the floor and putting her back down again that brings moments when her head lacks the necessary support. Parents should learn how to hold and transition baby from one place to another while keeping her head and neck supported. In the above photos, Donna demonstrates head support with Zizu (about 5 mos. old). The hand can be placed in back of the head so it is cradling the head while the wrist of the same arm crosses in back of the neck and upper back. This prevents the head from tipping backward beyond the position of extension. Extension of the neck is the position of the head when we sit up straight and look forward. Hyperextension is when we sit up straight and look up toward the sky. The latter should be avoided with baby. To complete our anatomy lesson we should also mention that flexion of the neck is the action of looking down toward the floor from a sitting position. When baby is lying on her back in your arms or on the floor, extension exists when her spine and head make a straight line that is parallel to the floor. Hyperextension, which we want to avoid, exists when the head tips backward from the point of extension. This causes great strain on the developing muscles and ligaments of the neck. The great range of motion that is possible with the head and neck exists because we need that mobility to look around us. The somatics pioneer Dr. Moshe Feldenkais referred to the head as the “perioscope of the senses.” You can imagine a submarine with the perioscope moving around to observe what is happening, to determine which way to go, and to steer clear of potential danger. That is what we are basically doing with our head and senses as we move. Thus, we need greater mobility in the neck region of the spine than we do the lower portions such as the middle of the back. The mid-back had less range of motion because it is part of the ribcage which protects vulnerable organs like the heart. The need here is for stability and protection. Babies develop strong neck muscles through motor skill development. Tummy-time is one of the most important activities for developing this strength. Tummy-time for babies teaches the gross motor skill of lifting the head. By putting baby on her stomach two or three times a day while supervised, she will learn to lift her head very high. At first, begin with only a few minutes on the tummy and gradually increase the time as her strength and comfort improves. This activity develops the strength in her neck and back muscles so she can eventually hold her head up on her own. Remember that it takes time, maybe 2 or 3 months, to develop this strength. Continue to support baby’s head until she can hold her head up on her own for a long time while on her tummy. One of the top ten Stellar Caterpillar movement skills is the motor milestone of lifting the head. Baby Zizu demonstrates the movement in the above photo. From the tummy time position she has learned to lift her head and see the world around her. She learned this skill in her first Stellar Caterpillar lesson! One of the most important developmental changes baby experiences with each motor milestone is an emotional one. When baby becomes comfortable in tummy time, she develops a few new skills. Perhaps the most important is the action of lifting her head up to see the world around her. This is a very exciting discovery for her as she lifts her head up off of the floor and sees activity, people and objects that are very interesting to her. This is a different perspective from the one she sees while lying on her back. The curiosity to see the world from this new perspective motivates her to continue to lift her head, strengthening her neck and back muscles. The experience of discovering a new outlook on her own, with no help from mom or dad, and reaping the reward of seeing much more of her environment, is emotionally satisfying to her. Madison recently visited the pediatrician for her check-up. He commented, “Wow! She sits very well! Most babies her age don’t sit this well.” This is what many mothers would love to hear. How did Madison acquire the baby milestone of sitting with excellent posture? Let’s take a look at her motor skill development over several months. Madison’s mother and father started bringing her for Stellar Caterpillar lessons at two months of age. We learned proprioception exercises and then tummy time soon after. The mother resisted the temptation to put her in a jumper, or to stand her on her feet, even though many mothers around her were doing these activities with their babies. When she received a jumper as a gift, she learned how it hinders development and then got rid of it. Madison’s mother learned the movements that promote optimal skill development and encouraged them with her baby. She gave her daughter plenty of floor time, for play and strengthening her muscles. The most common mistake for developing the posture of a baby is to put her in a sitting postion when she is not strong enough to sit on her own. Parents often put a hand behind baby’s back to catch her when she falls, as she does not yet have much balance. Many parents think this is how baby learns to sit. Some parents begin trying this when a baby is only three months old. This is too early to bring the baby to a sitting position. When the baby is not strong enough to sit up, she sits with a curve in her spine, shaped like the letter C. The head rounds forward and the spine rounds backward. The bones are not stacked on top of each other, so the muscles over work and become stiff. When a baby develops stiff torso muscles, tummy time is unpleasant and acquisition of motor skills may be delayed. Although the parents think they are helping baby learn to sit, they are actually making not only sitting, but many other motor skills more difficult and possibly delayed. All of our stellar caterpillars to date (Madison, Zizu, Rochel, and Ivan) developed excellent posture. We can learn from their stories how to guide baby to sit with perfect posture. Through Stellar Caterpillar lessons, their parents learned the motor skills that their babies needed to learn prior to sitting. They supported baby in healthy motor skill development through giving baby plenty of time on the floor and working with her just a few minutes each day to guide her learning process. They avoided using heavily marked baby gear such as jumpers, walkers and exersaucers that may delay motor development. Most importantly, they did not rush baby to sit, stand, or walk. Each parent recognized the important learning and strengthening contained in each motor milestone, giving baby plenty of floor time to maximize the benefits of each developmental stage. 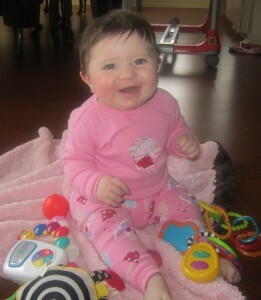 By around 7 months of age, when this photo was taken, Madison had been sitting up for just a couple of weeks. She transitioned perfectly from the floor to sitting and from sitting to the floor. By learning to roll and bend and stretch her legs, she prepared for those transitions. When she came to sit for the first time, she had perfect posture because her muscles were ready. She sat with ease and elegance. Her back and neck muscles were strong from lifting her head and rolling. Motor skill activities that prepare baby’s muscles for the sitting position include tummy time, lifting the head and rolling. 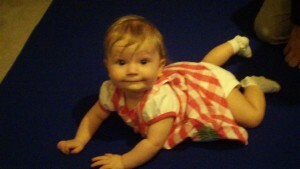 Her mother gave her supervised tummy time daily, two or three times a day for short intervals. Madison (and the other babies) could play on her tummy for long periods of time while holding her head very high. This developed head infant head control and strong back and neck muscles. Your baby, too can develop beautiful posture with this same approach. A few months ago we watched Madison learn to lift her head. Her mother practiced with her for about 10 minutes a day. Gradually her strength increased to where she could hold her head up for long periods of time. Madison first learned tummy time and then she gradually strengthened her neck and back muscles through daily practice of short intervals, no more than 10 minutes twice a day, of lifting her head. Eventually she could spend many more minutes in tummy time. After a few weeks of skill development with “lifting the head,” she began to learn the next motor milestone of rolling. During one of her Stellar Caterpillar lessons, she learned to turn from her back to her belly and from her belly to her back. After practicing that at home for several days, she began rolling through the house! What follows the developmental milestones of lifting the head and rolling? Belly crawling! Madison demonstrates the preparation for belly crawling by bending her left knee and leg so she can push off of the floor and scoot forward. This is the skill we focused on during today’s Stellar Caterpillar lesson. How does Madison need to move her body to prepare for belly crawling? She needs to lift up one side of the pelvis so the leg on that side becomes lighter in weight and the hip joint is free to bend. This drags up the leg and bends the knee. In the photo above, Madison lifted the left side of her pelvis to bend the left hip joint and drag up the left leg. Most of the skills Madison has learned were built from the tummy time position. This is where she learned lifting the head. She developed strong neck and back muscles as well as upper body strength. When reaching for and grasping toys in this position, she strengthens her upper body because she supports her weight with only one arm while the other one is busy playing with the toy. She learned to move her legs and pelvis in order to roll. When a baby masters tummy time, she prepares to conquer more milestones and become a true stellar caterpillar! Babies’ motor skill development progresses from one skill to the next in a manner where the preceeding skill prepares the muscles and bones of the baby for the succeeding movement. The infant motor skill of lifting the head strengthens the muscles of the neck and back while developing the appropriate curves in the bones of the spine. The muscles of the back, often referred to as the “anti-gravity muscles,” help our bodies overcome the force of gravity which could topple us over. Each action of lifting the head strengthens these muscles which run along the length of the spine and keep us upright. After a few months of lifting the head, baby sits up with beautifully erect posture. Without the skill of lifting the head, baby would sit with her spine in a letter “C” shape, lacking the curves in the neck that helps develop balance. In this “C” posture, baby falls over. With the curve in the neck developed, it counterbalances the rest of the spine and stabilizes baby in the sitting position. While sitting, baby maintains balance as she turns to reach for a toy or looks up at her mother. She is stable and confident in this position. Rochel’s star sits elegantly in the sky!